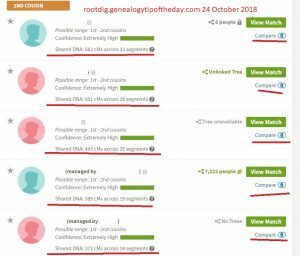 There are things about genealogical research that have not changed since I began my research in the early 1980s–and there are things that have changed drastically. Searching the census is one of those things that, in some ways, has changed drastically. Finding people in the census is significantly easier now than it was then. That’s true of many records that have been indexed. The same challenge still applies–confirming that you’ve found the correct person in that census enumeration. In the old days, when page-by-page searches were necessary for many censuses, it was necessary to think long and hard about where that person was likely living. That pre-planning was done to make better use of research time. It also helped researchers to know they were more likely to have the “right person” because (using other records and known information) they had already hypothesized about where that person had reasonably lived and where they should have been enumerated. Even when there were census indexes, they often were only to some of the names enumerated (often heads of household and others in the household with a different surname from the head of household). That presented challenges when searching for children and others who might have been living in a household with a parent or grandparent with the same last name. There were no transcriptions of the entire census record. Census indexes “back in the day” were truly a finding aid requiring one to look at the original. Of course, it’s still advised to look at the original even when the database being used is a complete transcription. People make errors. Scrolling the entire township or neighborhood forced one to look at the names of neighbors. That helped the researcher get an idea of the ethnic mix of the neighborhood, common occupations in the area, etc. and may have caused the researcher to become familiar with other names in the location. That was a good thing. There was an article in my newspaper about the Census Bureau not having enough money to complete the 2020 census. I wrote to the editor telling him I thought the census was important for genealogists and sociologists, and how the had different questions such as owning a radio in 1930 and where they lived in 1935 on the 1940 census. They printed my letter! The other night I was working with a couple apparently in my tree. They had spent their lives in the same general area of England in the late nineteenth century. A record popped out on Ancestry which indicated that the couple-who may or may not have ever married-had gotten married in Montana! At least the names were the same. I concluded that the computer had made a mistake. It was highly unlikely this laboring class duo could’ve sprung for a (very) long weekend in Montana.